Today’s literature is replete with myth-busting advice for the next generation of women leaders. Several development themes are emerging such as: the need to behave more confidently; the fact that you may be stuck at your current organisational level because you are “too good” at every detail of your current job. Another common problem is that women expect others to notice and reward their excellent contributions and often fail to claim their own achievements, as this is viewed as “too self-serving”. Two other common themes for female leadership development are: the need to let go of perfectionism; and to stop our collective habit of putting ourselves last. This theme “women eat last” has amazed me in its constancy over the last number of years; within all levels of society. In the early part of this century, surprising though this may be to younger women, successful females did not mention any challenges outside work. This was certainly true in the financial services industry, where I was a Senior Leader. It was a case of ‘turn up and put on your professional mask’ no matter what was happening. Even talking about your dependents was a sign of weakness. We “ambitious women” pushed ourselves to get back to work as soon as possible after having babies. Doing otherwise was an indulgence and was interpreted as a ‘lack of ambition.’ Part-time working, as a female, was the death-knell for your career. Sadly, talking to women leaders in male-dominated industries today, some outdated expectations persist in Ireland. As an executive and top team coach for over 25 years, what I am now witnessing on the ground is the emergence of a new type of confident, female leadership. Female leaders that are admired and are considered “rising stars” in corporations are bringing their authentic selves to work. 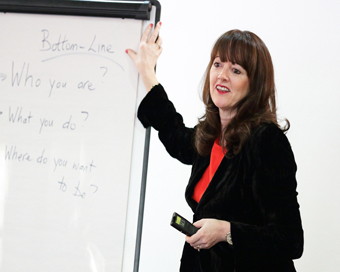 Women leaders are realising that innate power comes from “being who you are”. The biggest shift I notice is that it’s now acceptable to talk about your children and other responsibilities outside work. Women leaders have a core and natural strength that they can leverage in the workplace: Empathy. Women leaders have long known that “Human beings come to work, not human doings.” The more that any leader can show vulnerability, the more connected others feel to that leader. This is true of both male and female leaders. Dr. Brene Brown, author and professor at the University of Houston, has written extensively on this topic and is well worth checking out. By contrast, a topic I often need to explore with male leaders (executives) is how to connect more deeply with their colleagues. Some leaders have been promoted because of their technical competency and excellence at executing tasks. Now, overnight, they are expected to develop emotional intelligence at work. This can be very challenging for some leaders…. particularly if it’s later in their career. These leaders can learn a lot from connected, authentic female leaders in their organisations (sometimes referred to as reverse mentoring). As a nation, we know that women are underrepresented in top jobs. This has given rise to many positive interventions such as the 30% Club. In my work with top teams, many of the leaders are male. Organisations have yet to catch up with the assertion that women are the new global growth engine. Really? Is it any surprise that the women who have made it to the top can suffer from ‘impostor syndrome?’ They question themselves continually: “Do I really deserve to be here? Do I have something useful to say? Do I sound silly?” They will tend to hold back and not voice their opinions until they are 100% sure that they are right. They must learn to operate with 80% certainty and to project confident body language in the Boardroom, at minimum, to survive. I truly believe that the key to leadership and organisational success in the workplace today is through authenticity, flexibility and learning agility. Women leaders have natural strengths in all these competencies, when they have the confidence to be themselves. Women and men need to get over the gender stereotypes such as: “Bossy Female” – “Token Female” – “Too Emotional” to name but a few (Forbes). It is a no-win situation if we all get caught up with these labels. The only road forward is to be an authentic leader and live in line with your own core values. This is the compass that will help you achieve success in your own terms.